From the Gilder The Age Of Exploration, "The Columbian Exchange," by Alfred Crosby -- Millions of years ago, continental drift carried the Old World and New Worlds apart, splitting North and South America from Eurasia and Africa. That separation lasted so long that it fostered divergent evolution; for instance, the development of rattlesnakes on one side of the Atlantic and vipers on the other. After 1492, human voyagers in part reversed this tendency. Their artificial re-establishment of connections through the commingling of Old and New World plants, animals, and bacteria, commonly known as the Columbian Exchange, is one of the more spectacular and significant ecological events of the past millennium. 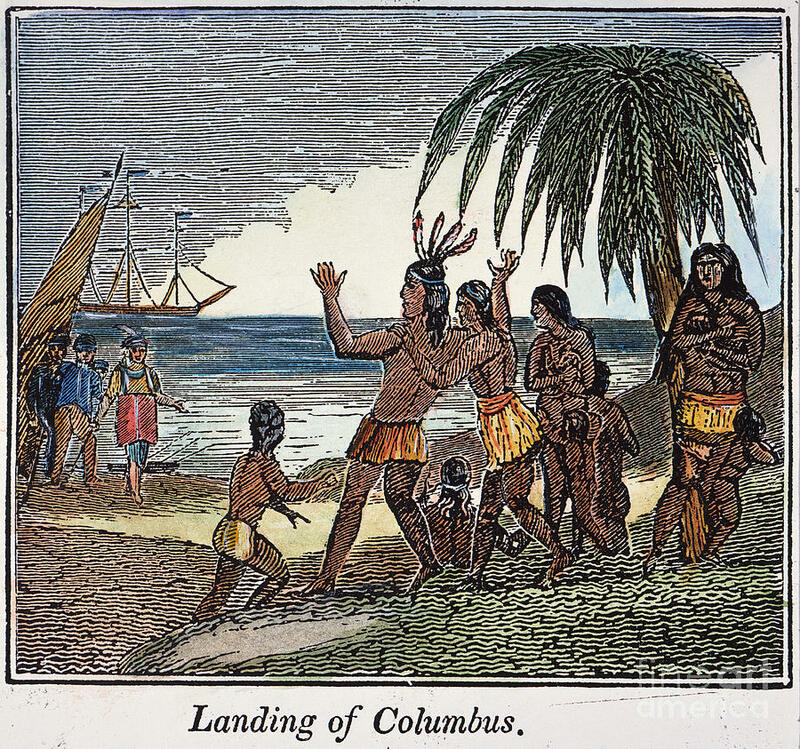 When Europeans first touched the shores of the Americas, Old World crops such as wheat, barley, rice, and turnips had not traveled west across the Atlantic, and New World crops such as maize, white potatoes, sweet potatoes, and manioc had not traveled east to Europe. In the Americas, there were no horses, cattle, sheep, or goats, all animals of Old World origin. Except for the llama, alpaca, dog, a few fowl, and guinea pig, the New World had no equivalents to the domesticated animals associated with the Old World, nor did it have the pathogens associated with the Old World’s dense populations of humans and such associated creatures as chickens, cattle, black rats, and Aedes egypti mosquitoes. Among these germs were those that carried smallpox, measles, chickenpox, influenza, malaria, and yellow fever. The Columbian exchange of crops affected both the Old World and the New. Amerindian crops that have crossed oceans—for example, maize to China and the white potato to Ireland—have been stimulants to population growth in the Old World. The latter’s crops and livestock have had much the same effect in the Americas—for example, wheat in Kansas and the Pampa, and beef cattle in Texas and Brazil. The full story of the exchange is many volumes long, so for the sake of brevity and clarity let us focus on a specific region, the eastern third of the United States of America. As might be expected, the Europeans who settled on the east coast of the United States cultivated crops like wheat and apples, which they had brought with them. European weeds, which the colonists did not cultivate and, in fact, preferred to uproot, also fared well in the New World. John Josselyn, an Englishman and amateur naturalist who visited New England twice in the seventeenth century, left us a list, “Of Such Plants as Have Sprung Up since the English Planted and Kept Cattle in New England,” which included couch grass, dandelion, shepherd’s purse, groundsel, sow thistle, and chickweeds. One of these, a plantain (Plantago major), was named “Englishman’s Foot” by the Amerindians of New England and Virginia who believed that it would grow only where the English “have trodden, and was never known before the English came into this country.” Thus, as they intentionally sowed Old World crop seeds, the European settlers were unintentionally contaminating American fields with weed seed. More importantly, they were stripping and burning forests, exposing the native minor flora to direct sunlight and to the hooves and teeth of Old World livestock. The native flora could not tolerate the stress. The imported weeds could, because they had lived with large numbers of grazing animals for thousands of years. Cattle and horses were brought ashore in the early 1600s and found hospitable climate and terrain in North America. Horses arrived in Virginia as early as 1620 and in Massachusetts in 1629. Many wandered free with little more evidence of their connection to humanity than collars with a hook at the bottom to catch on fences as they tried to leap over them to get at crops. Fences were not for keeping livestock in, but for keeping livestock out. Members of the Catawba Nation at the 1913 Corn Exposition in Rock Hill, South Carolina. The missionaries and the traders who ventured into the American interior told the same appalling story about smallpox and the indigenes. In 1738 alone the epidemic destroyed half the Cherokee; in 1759 nearly half the Catawbas; in the first years of the next century two-thirds of the Omahas and perhaps half the entire population between the Missouri River and New Mexico; in 1837–1838 nearly every last one of the Mandans and perhaps half the people of the high plains. European explorers encountered distinctively American illnesses such as Chagas Disease, but these did not have much effect on Old World populations. Venereal syphilis has also been called American, but that accusation is far from proven. 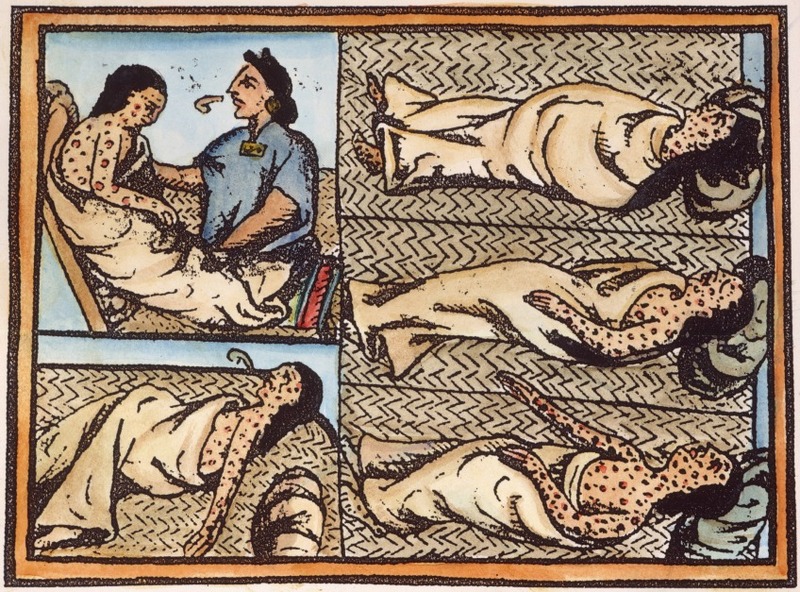 Even if we add all the Old World deaths blamed on American diseases together, including those ascribed to syphilis, the total is insignificant compared to Native American losses to smallpox alone. The export of America’s native animals has not revolutionized Old World agriculture or ecosystems as the introduction of European animals to the New World did. America’s grey squirrels and muskrats and a few others have established themselves east of the Atlantic and west of the Pacific, but that has not made much of a difference. Some of America’s domesticated animals are raised in the Old World, but turkeys have not displaced chickens and geese, and guinea pigs have proved useful in laboratories, but have not usurped rabbits in the butcher shops. The New World’s great contribution to the Old is in crop plants. Maize, white potatoes, sweet potatoes, various squashes, chiles, and manioc have become essentials in the diets of hundreds of millions of Europeans, Africans, and Asians. Their influence on Old World peoples, like that of wheat and rice on New World peoples, goes far to explain the global population explosion of the past three centuries. The Columbian Exchange has been an indispensable factor in that demographic explosion. New Diet Taps into Pioneering Idea to Help Dieters Get Rid Of 23 Pounds in Just 21 Days!